I decided to put sessions and workshops together because they both focus on getting the participants, rather than me to make the music. For years I have been playing at informal sessions in pubs mostly, and always unpaid. Its a great way to enjoy music and it keeps me in touch with other musicians, I like the fact that unlike paid gigs there is no pressure to perform or please the audience – you can play what you want, how you want. I started an acoustic session at The Dingle, Jesse Rd, Narberth, SA67 7DP. 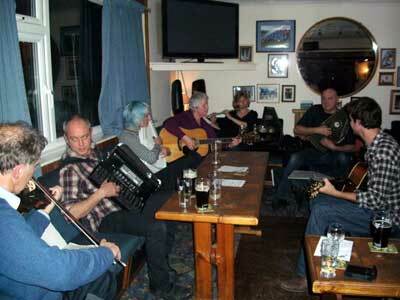 Sadly the venue closed in spring of 2016 after 5 successful years – however musicians now meet every Tuesday from 8.00pm in the Boars Head in Templeton. Anything goes musically and players are encouraged to join in with each other – we get folk, blues, pop, bluegrass and rock. There is still a Dingle Acoustic Session facebook page here. I have done hundreds of workshops over the years, many in Schools. Workshops have ranged from short interactive concerts maybe with percussion and singing to complex planned multi-visit projects culminating in an end product. 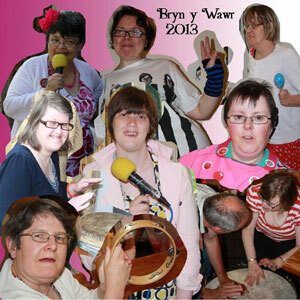 One recent project I did was to record members of a residential home for adults with special needs singing their favourite songs. The end product was a CD that they could keep. I recorded all the backing tracks with percussion and backing vocals from the group, and used vocoder and pitch shift technology on the lead vocals to make a funky product. Helen Adam, the fiddle player from my duo Fiddlebox is a great workshop organizer and we have done many different ones over the years. We have taught shanties and folk dances to children visiting the Tall Ships Festival done Welsh language song sessions in Swansea’s Waterfront Museum and ran a Song-writing project at Neyland Primary School. The children chose themes, then wrote phrases and gradually put a lyric together as a group. Then they improvised sung lines until, by general consensus a tune was arrived at. The project finished with a live performance of their songs which I recorded and the video was posted on youtube for them and their families and friends to see. Here it is!